Genuine OEM Konica-Minolta Toner Cartridge, Black, 6,000 page yield. Konica-Minolta part number: A06V132. 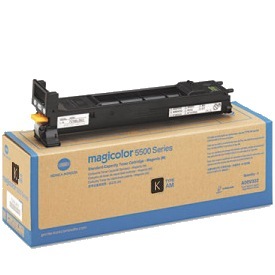 Laser Toner Cartridge compatible with Konica-Minolta magicolor 5550, 5570, 5650EN, 5670EN. Genuine OEM Konica-Minolta Toner Cartridge, Cyan, 6,000 page yield. Konica-Minolta part number: A06V432. Color Laser Toner Cartridge compatible with Konica-Minolta magicolor 5550, 5570, 5650EN, 5670EN. Qualifies for free shipping & earn 172 points! Genuine OEM Konica-Minolta Toner Cartridge, Cyan, High Capacity 12,000 page yield. Konica-Minolta part number: A06V433. Color Laser Toner Cartridge compatible with Konica-Minolta magicolor 5550, 5570, 5650EN, 5670EN. Qualifies for free shipping & earn 215 points! Genuine OEM Konica-Minolta Toner Cartridge, Magenta, 6,000 page yield. Konica-Minolta part number: A06V332. Color Laser Toner Cartridge compatible with Konica-Minolta magicolor 5550, 5570, 5650EN, 5670EN. Genuine OEM Konica-Minolta Toner Cartridge, Magenta, High Capacity 12,000 page yield. Konica-Minolta part number: A06V333. Color Laser Toner Cartridge compatible with Konica-Minolta magicolor 5550, 5570, 5650EN, 5670EN. Genuine OEM Konica-Minolta Toner Cartridge, Yellow, 6,000 page yield. Konica-Minolta part number: A06V232. Color Laser Toner Cartridge compatible with Konica-Minolta magicolor 5550, 5570, 5650EN, 5670EN. Genuine OEM Konica-Minolta Toner Cartridge, Yellow, High Capacity 12,000 page yield. Konica-Minolta part number: A06V233. Color Laser Toner Cartridge compatible with Konica-Minolta magicolor 5550, 5570, 5650EN, 5670EN. Genuine OEM Konica-Minolta Toner Cartridge, Black, High Capacity 12,000 page yield. Konica-Minolta part number: A06V133. Laser Toner Cartridge compatible with Konica-Minolta magicolor 5550, 5570, 5650EN, 5670EN. Genuine OEM Konica-Minolta Toner Cartridge Bundle Pack, High capacity 12,000 page yield. Bundle pack includes: one Cyan, one Magenta, and one Yellow toner cartridge. Konica-Minolta part number: A06VJ33. Color Laser Toner Cartridge compatible with Konica-Minolta magicolor 5550, 5570, 5650EN, 5670EN. Qualifies for free shipping & earn 618 points! Genuine OEM Konica-Minolta Imaging Unit, Cyan, 30,000 page yield. Konica-Minolta part number: A0310GF. Imaging Unit compatible with Konica-Minolta magicolor 5550, 5570. Qualifies for free shipping & earn 221 points! Genuine OEM Konica-Minolta Imaging Unit, Magenta, 30,000 page yield. Konica-Minolta part number: A0310AF. Imaging Unit compatible with Konica-Minolta magicolor 5550, 5570. Genuine OEM Konica-Minolta Imaging Unit, Yellow, 30,000 page yield. Konica-Minolta part number: A03105F. Imaging Unit compatible with Konica-Minolta magicolor 5550, 5570. Genuine OEM Konica-Minolta Imaging Unit, Black, 30,000 page yield. Konica-Minolta part number: A03100F. Imaging Unit compatible with Konica-Minolta magicolor 5550, 5570. Genuine OEM Konica-Minolta Imaging Unit Bundle Pack, 30,000 page yield. Bundle pack includes: one Cyan, one Magenta, and one Yellow imaging unit. Konica-Minolta part number: A0310NF. Imaging Unit compatible with Konica-Minolta magicolor 5550, 5570. Qualifies for free shipping & earn 590 points! Genuine OEM Konica-Minolta Transfer Belt, 120,000 page yield. Konica-Minolta part number: A06X011. Transfer Belt compatible with Konica-Minolta magicolor 5550, 5570.